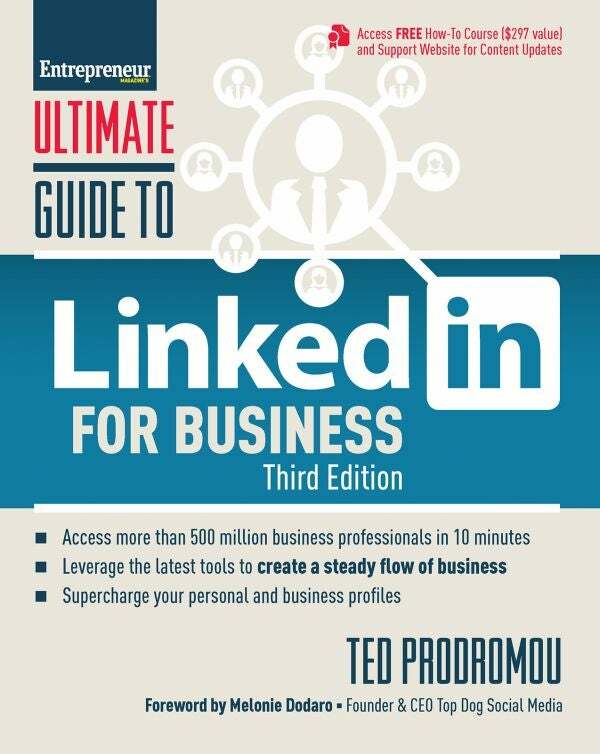 Ted Prodromou is the author of Ultimate Guide to LinkedIn for Business (Entrepreneur Press®, 2019) as well as a speaker, author and online advertising consultant, generating leads for his clients using Google AdWords, Facebook ads, LinkedIn, Twitter, and other social media platforms. He also teaches online and in-person classes on LinkedIn, Twitter, and online advertising. In his past life, Ted worked for high tech companies IBM, DEC and Cellular One before starting his own consulting firm in 1999. You can learn more about Ted at tedprodromou.com. Ted Prodromou guides readers through crafting the perfect profile that gets them hired, gives them the tools they need to market themselves, and shares case studies on how to sell their business and their products-all on LinkedIn. How to get connected with 300 million customers in 10 minutes. Let us show you how this premium app could be worth its weight in superior sales leads. These smart tips from a LinkedIn expert will help you find the right job candidates the same day you start your hunt. Because great ads are more than just words. LinkedIn provides an affordable way to get your message out to a targeted audience using 9 easy-to-employ options. Use these seven tools from LinkedIn to track down the best job candidates for your business. Find the candidates you want quickly via LinkedIn's Search and Advanced Search tools. Find out if you're wasting your time on LinkedIn by measuring how effective your status updates and posts are with your audience. Learn two ways you can use this social site to connect with new employees, customers and vendors. Make LinkedIn your next best source for job candidates by reading through the recommendation section. Find out what you can showcase -- and how -- on your company's LinkedIn page to attract new employees and new business. To make yourself stand out among the thousands of other people on LinkedIn, create a compelling profile using this advice. How to create Twitter content that's forwarded over and over again. Who should you follow? How many people should you follow? How often should you tweet? Most people don’t get Twitter. Longtime internet guru Ted Prodromou shows you how to become someone who does. Set to prove that 140 characters or less and a hashtag can dramatically grow your brand and your business, Prodromou takes you step by step into the Twitterverse and shows you how to tweet your way to the top of your industry. Ted Prodromou has put together a comprehensive Twitter guide for real businesses in the real world. Whether you need to get up to speed on Twitter, or you're looking for some more advanced ‘pro tips,’ this is a great reference. When Twitter was launched in 2006, nobody could have imagined the impact 140 characters or less would have on our lives...or our businesses. Today Twitter is THE source for breaking news events, communicating with your friends, and even marketing your business. Ultimate Guide to Twitter for Business shows you how to build a powerful online community of raving fans that can become your most effective marketing channel. Nothing beats word-of-mouth marketing and Twitter is the perfect tool to spread the word about your business. 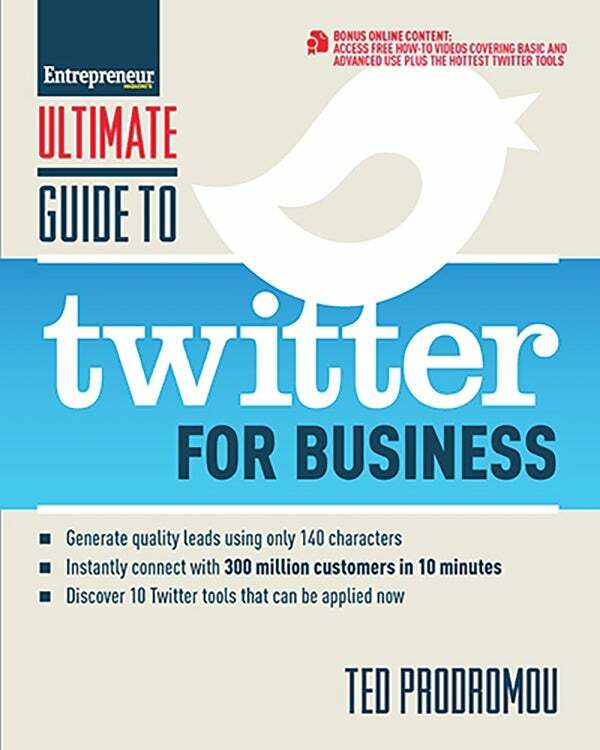 Ultimate Guide to Twitter for Business helps you understand why Twitter has become such a powerful communications tool. This easy-to-follow guide shows you step by step how to use Twitter to more effectively communicate, create deeper engagement, and build lasting relationships with your customers. This is just the guide a direct marketer needs. Ted gives you a plan for marketing, executing sales, better support, and ongoing reputation management. You know it’s smart to connect with over 500 million business professionals on LinkedIn, but you may not know how to do it without wasting tons of time and money. LinkedIn expert and trainer Ted Prodromou delivers a step-by-step guide to using LinkedIn to grow your business, find profitable clients and customers, and hire the perfect employees. With more than a decade of experience helping businesses and entrepreneurs grow using SEO, pay-per-click management, and LinkedIn, Prodromou shares the most effective ways to keep you and your business in front of decision makers and build strong referral networks.